Russian town in the government of Wilna; at the present time (1905) it belongs to Prince Tishkewitz. As in most other Lithuanian towns, the Jews constitute the greater part of the population. Jews settled there about the middle of the sixteenth century. 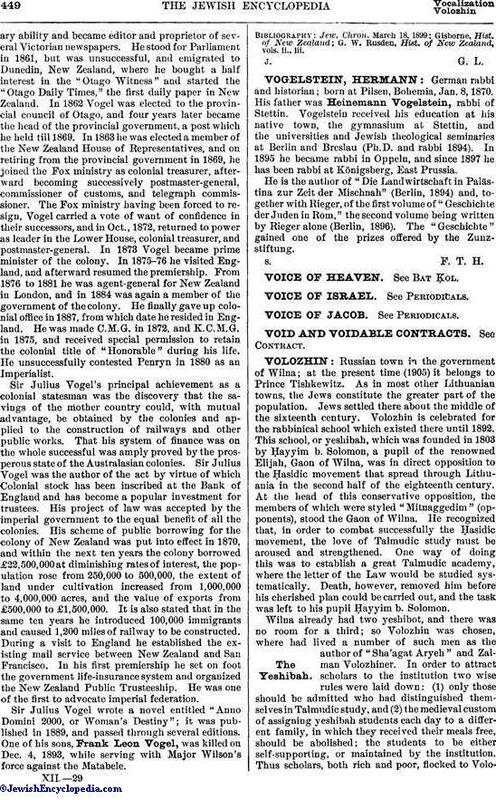 Volozhin is celebrated for the rabbinical school which existed there until 1892. This school, or yeshibah, which was founded in 1803 by Ḥayyim b. Solomon, a pupil of the renowned Elijah, Gaon of Wilna, was in direct opposition to the Ḥasidic movement that spread through Lithuania in the second half of the eighteenth century. At the head of this conservative opposition, the members of which were styled "Mitnaggedim" (opponents), stood the Gaon of Wilna. He recognized that, in order to combat successfully the Ḥasidic movement, the love of Talmudic study must be aroused and strengthened. One way of doing this was to establish a great Talmudic academy, where the letter of the Law would be studied systematically. Death, however, removed him before his cherished plan could be carried out, and the task was left to his pupil Ḥayyim b. Solomon. Wilna already had two yeshibot, and there was no room for a third; so Volozhin was chosen, where had lived a number of such men as the author of "Sha'agat Aryeh" and Zalman Volozhiner. 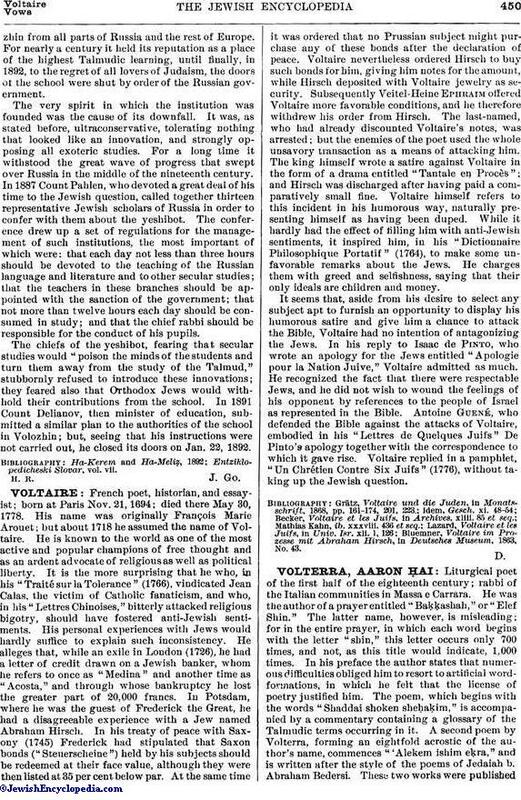 In order to attract scholars to the institution two wise rules were laid down: (1) only those should be admitted who had distinguished themselves in Talmudic study, and (2) the medieval custom of assigning yeshibah students each day to a different family, in which they received their meals free, should be abolished; the students to be either self-supporting, or maintained by the institution. Thus scholars, both rich and poor, flocked to Volozhinfrom all parts of Russia and the rest of Europe. For nearly a century it held its reputation as a place of the highest Talmudic learning, until finally, in 1892, to the regret of all lovers of Judaism, the doors of the school were shut by order of the Russian government. The very spirit in which the institution was founded was the cause of its downfall. It was, as stated before, ultraconservative, tolerating nothing that looked like an innovation, and strongly opposing all exoteric studies. For a long time it withstood the great wave of progress that swept over Russia in the middle of the nineteenth century. In 1887 Count Pahlen, who devoted a great deal of his time to the Jewish question, called together thirteen representative Jewish scholars of Russia in order to confer with them about the yeshibot. The conference drew up a set of regulations for the management of such institutions, the most important of which were: that each day not less than three hours should be devoted to the teaching of the Russian language and literature and to other secular studies; that the teachers in these branches should be appointed with the sanction of the government; that not more than twelve hours each day should be consumed in study; and that the chief rabbi should be responsible for the conduct of his pupils. The chiefs of the yeshibot, fearing that secular studies would "poison the minds of the students and turn them away from the study of the Talmud," stubbornly refused to introduce these innovations; they feared also that Orthodox Jews would withhold their contributions from the school. In 1891 Count Delianov, then minister of education, submitted a similar plan to the authorities of the school in Volozhin; but, seeing that his instructions were not carried out, he closed its doors on Jan. 22, 1892.